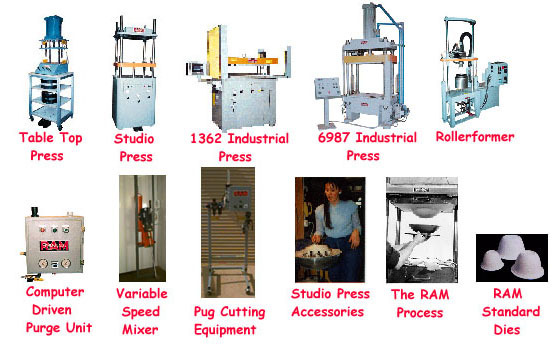 RAM Products, Inc. is an original equipment manufacturer of hydraulic presses and other equipment for the ceramics industry. In addition to a standard line of equipment, RAM designs and builds systems, machines and components to meet your needs. The RAM Process and RAM Dies are described on the following pages. History of the RAM Process - A brief history of the RAM Process. The Art Of Die Making - This article describes several important considerations in making a die for RAM pressing. What's New with the RAM Process? - This article describes recent improvements in the RAM Process.